Click here to subscribe to my mailing list and get 15 free running workouts and more. For half marathon training it is easy to motivate oneself, often more so as for other long distance event. Being one of those events that once you master it, get in the speed work needed and gain experience + focus, it is possible to run the 1 2 marathon on a very regular basis. But it takes self discipline as the main aim in a half marathon training program is running right around your lactate threshold. You have reached the startingpage on info about half marathon training. Here you'll find tips on how to be training for the half marathon, either as a separate event or as part of a marathon training plan. Whether you are a beginner,intermediate or advanced type of runner. Ok, lets hit if off with some half marathon focus points first. The Anaerobic Threshold Runs Is Running The Workouts At Actual 21km Pace. That is, right at the anaerobic tipping point when you just start to accumulate lactate acid. Training at this pace, is a pace right below when you start to increase your breathing substantially. Sort of just below your comfortable "talking pace" when you are running. It should be the key element in any endurance distance running program. But more so in any other event, as the half marathon itself is run right at this intensity. Fact is that this kind of training will not only help you get fit and improve your running time. In addition to this, you'll find a general increase in energy during runs, from training all the way between the 5k, 10k and up until the marathon. But the anaerobic threshold is the engine itself. So what are some other key elements in a half marathon training schedule ? 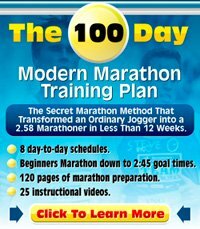 What are some good general running tips on how to half marathon ? At week number 11 in there I have planned a Half Marathon Race. Which means you have a complete half marathon training schedule and marathon training schedule in one ! You have 8 different day to day schedules to pick from, so that you can run fit it perfectly to your individual goal. You want to go for the long runs but unlike for the marathon there is no need running at a very slow speed, Sunday type workouts for three hours where you sort of just count the minutes as time goes by - and not focusing on the aerobic fitness. The goal would rather be to put in strength work in terms of shorter runs with a faster finish. Before finishing it up at around 10k pace at the end. So you a sort of warming up the system with sub marathon pace before going over to 10k type pace at the end once your running engine is in working mode and ready for it. These workouts should be the core of any half marathon training routine. Whether it is to finish a half marathon (at least if you are not a true beginner - in that case a Galloway style walk-run program where you run half and have walk breaks is much better + about 1/3 cross training), to run it without rest, or to finish it in a very fast time. For most, this is the single most effective way to get a massive increase in performance. Both short-term and long term. Second up is a a good periodization plan. You can read more about this in the article right below. A good periodization plan should be part of any individualized marathon or half marathon training program. The article is located here : Training For A Half Marathon - periodization considered. Do this differ in the different distances. That is, the 5k,10k,half marathon + the marathon. With a lactate acid measurement system it was possible to monitor exactly how "hard" these athletes were training. The result for the half marathon training athletes ? They were training on a mixed variety of either an intensity right below the lactate threshold (where you start accumulating lactate acid). And an intensity right below 5k and 10k pace. In a large number of km. It was all about endurance. In addition to that, you could see a periodization throughout the year, much like what I explain in the article above about training for a half marathon periodization. In the Half Marathon Training Schedule article, you'll find some different viewpoints on how to to view/use the half marathon in your training. Whether it is for prime half marathon training, as part of a marathon plan or a 5k/10k plan. The half marathon is increasing its popularity throughout. And we are seeing some big half marathon races building up. Below will be added reviews to some of the main half marathons at the moment. First up is a review of the Chicago Half Marathon an excellent half to run. Second is the Sydney Half Marathon - a real good choice down south. And the third of the main ones is the extremely fast and well organized Carlsbad Half Marathon. Not to mention the quite fast summetime marathon in New York - The New York City Half Marathon organized by the New York Road Runners. This is one of the premier half marathon running events in the world and is something to consider for a fast time and special half marathon experience. In addition to this, there are a number of up-coming half marathons with a charity focus as well as the competative part. One of them is the Meadows Half Marathon that you can read about here. 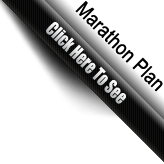 Thanks for your time and click below if you want to return to Marathon Training Schedule homepage.